The terminally ill Baby Joseph, who was at the heart of a legal and ethical debate over the right to life, passed away Tuesday by his family’s side at his Windsor Ontario home. The 20-month old Joseph Maraachli had suffered from a degenerative neurological disease which left him in a vegetative state and requiring assisted breathing. 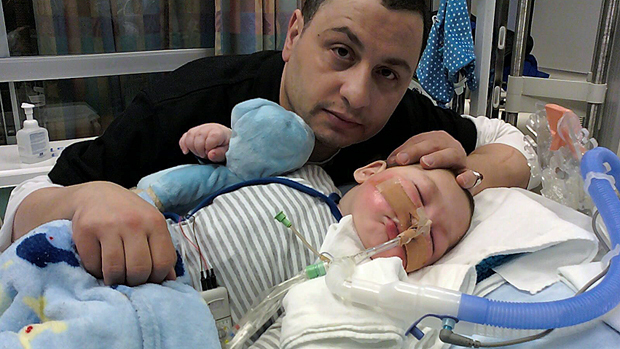 His story sparked controversy when Canadian doctors decided to take Baby Joseph off assisted breathing but refused his parents’ request to preform a tracheotomy. The operation, implanting a passageway from the trachea through the neck, would allow the infant to leave the hospital and peacefully die at home but was deemed invasive and medically unnecessary. His parents Moe and Sana Maraachli took legal action against the London On., hospital but a provincial court rejected their plea for life. Refusing to abandon the battle, they took to the States where American right-to-life groups, such as Priests for Life, helped the family and transfered him to hospital in St. Louis Mo., where Baby Joseph received the operation at last. The family returned home a month later. Baby Joseph became the center of much right-to-life debate. The case drew parallels to the Terri Schiavo case where there was a court order to remove a woman in a vegetative state from life support. Her husband gave his consent despite her parents protests. The Terri Schiavo Life & Hope Network offered support and medical finance for Baby Joseph.